This week was full of celebration and wonder. We have tasted hot cross buns and thought about the taste, texture, smell and shape. We thought about Spring and new life. We worked as a class to list all things which could be found in an Easter garden. 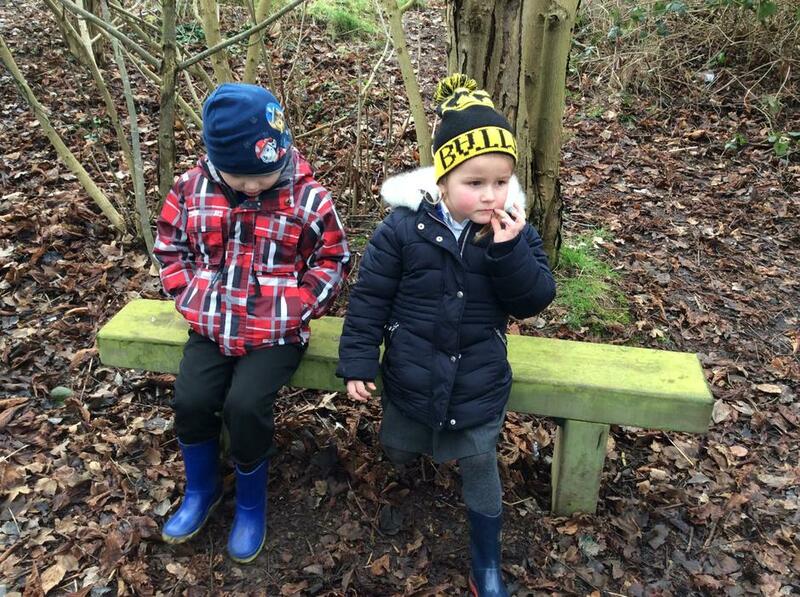 We then took an adventure to the outdoor classroom and explored around to collect our items. We were able to make our very own Easter garden. 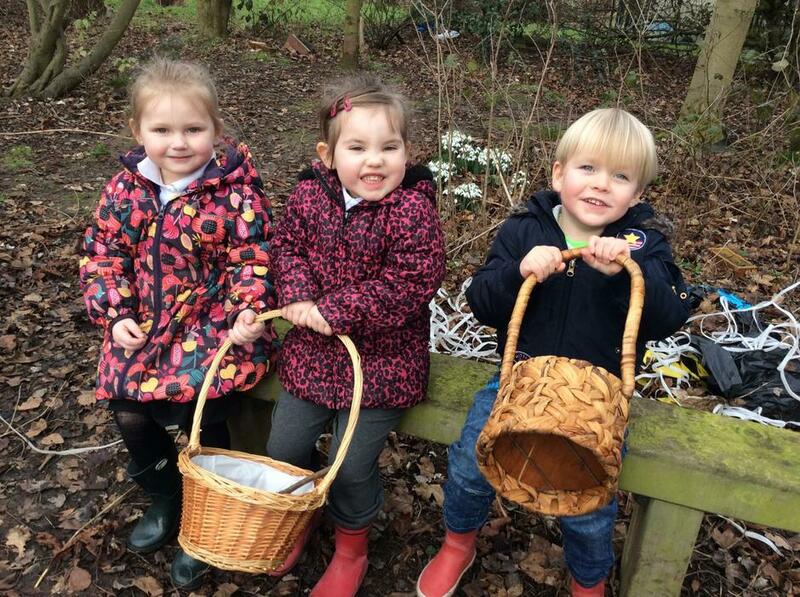 We were also very lucky to make Easter nests and took part in the community Easter Bonnet Parade. 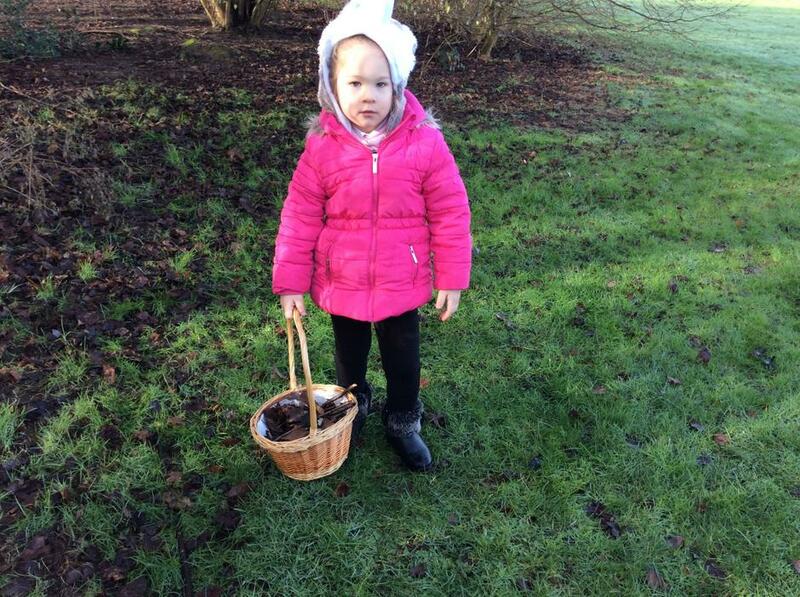 We also had a special visit from the Easter Bunny who had left eggs for us to find! 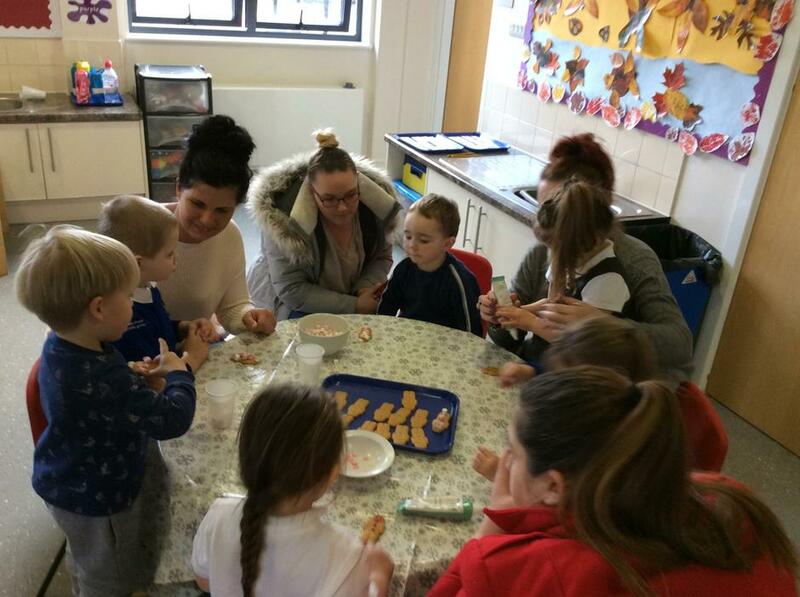 This week we invited the grown ups to come along and learn with us! Every half term you are invited to come and join us, to see and take part, in our learning at school. These sessions are to help include you in your child's learning as much as possible. So far we have done various stay and play sessions that have covered, early reading, early writing and gross/fine motor skills. 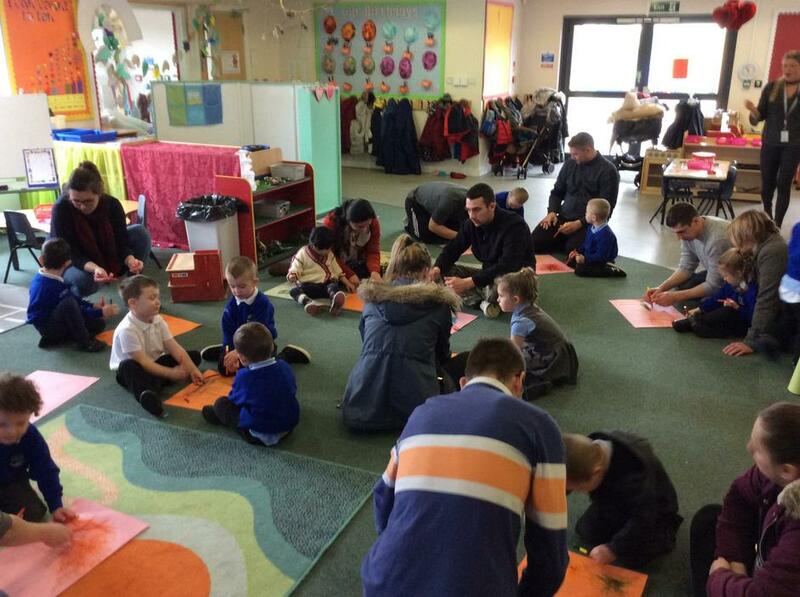 This stay and play had a particular focus around the teaching of maths in nursery, and how we introduce the beginning of mathematical thinking. Of course - we make maths as fun as possible! And the children kick started the session with a special number performance. They performed, 5 Current Buns and How Many Fingers? Due to it being Mother's Day at the weekend, the children also sang an extremely heart warming performance of, You Are My Sunshine. Below show more pictures of the fantastic work which was done with parents. There was card making, playdough, craft, and seed potting. Please water your seed and help it grow. This week we welcomed Spring. We explored a range of seasonal flowers, such as daffodils, daisies and blossom. We discussed the meaning of new life and animals such as, baby chicks, lambs and frogspawn. Our new Spring themed bookshelf has allowed the children to explore the wonders of Spring further. Our bookshelf also has puppets for the children to use in their play and act out familiar stories. The Very Hungry Caterpillar, our focus story, has helped us understand more about Spring and new life. We are very lucky to have five of our own caterpillars in the nursery classroom. Ask your child about the life cycle of a caterpillar, we are confident they will be able to explain! We are excited to watch our own caterpillars grow and turn into beautiful butterflies. Next, we went on a journey and felt what it is like to be a very hungry caterpillar. We had to taste all the different fruit from the story! This was very exciting and super healthy. Our student helper, Miss Willerton, did a great job with helping us try our fruit. We then had a vote on our favourite fruit and made a chart! We could work our the biggest number (most likes) and the smallest number (least likes). 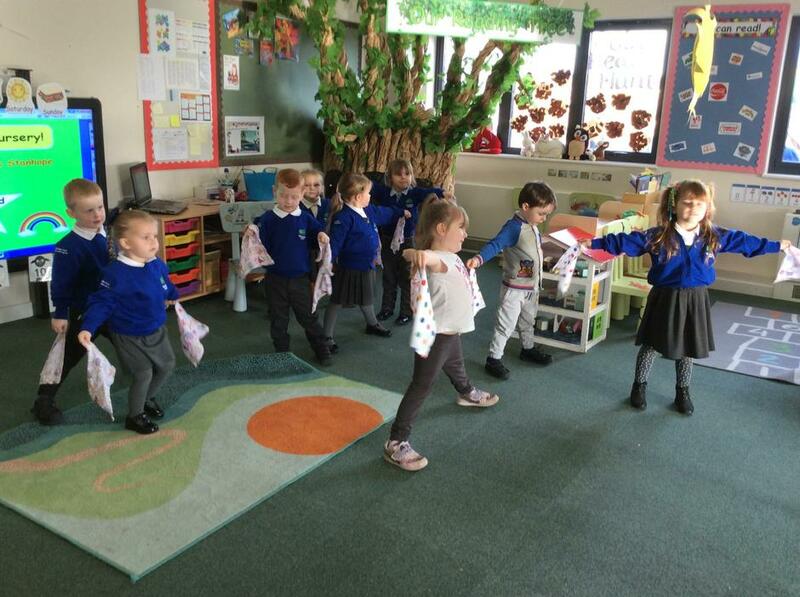 This week has seen us learn about 10 Little Dinosaurs, Shapes and Red Nose Day! 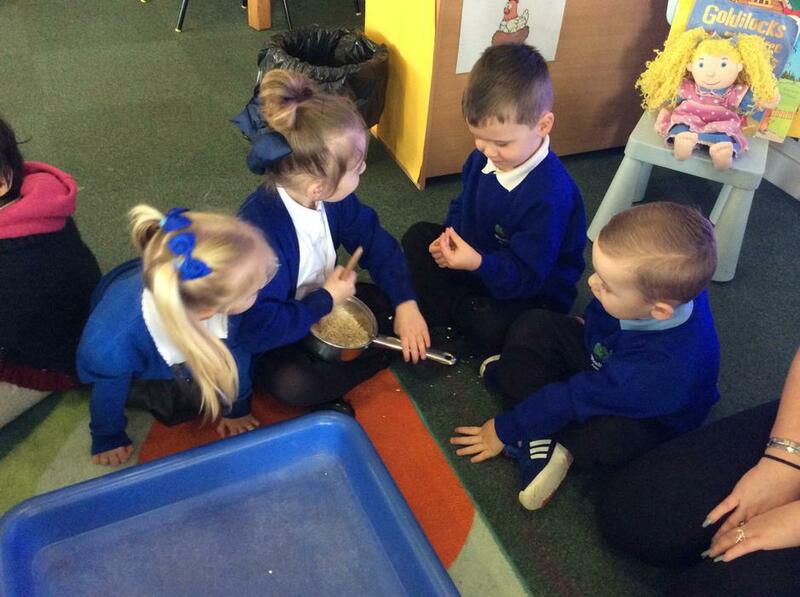 We are super busy learning all the time in Nursery. 10 Little Dinosaurs, by Mike Brownlow has allowed the children to count from 10 to 1 and back again. 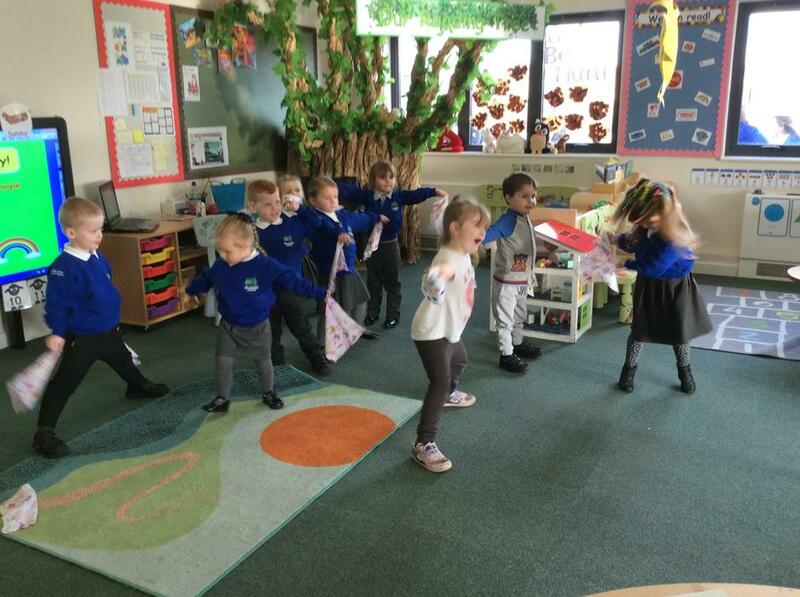 We had a stomping adventure using numbers, and also learnt the dinosaur stomp dance. The children have also enjoyed our new 'Dino World' along with painting their own dinosaur to make a counting display! 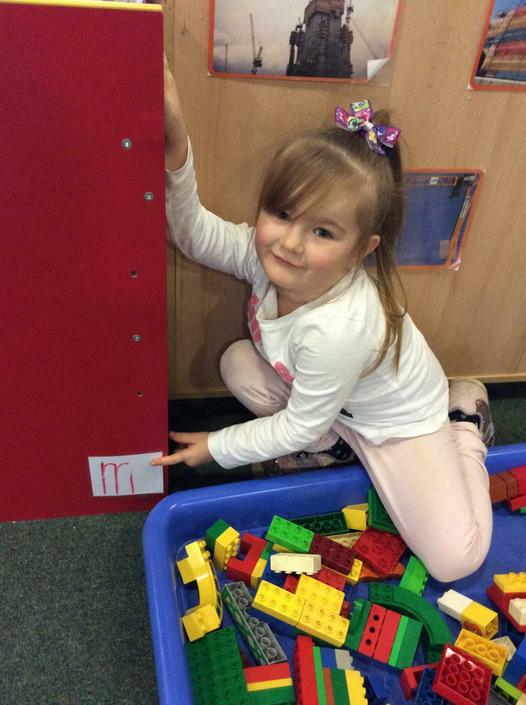 In children's early years, it is important they gauge an understanding of shape, space and measure. This week we also discussed 2D shapes, had a shape hunt, and played a shape matching activity. The children then produced a piece of work which required them to cut out different shapes and stick them onto paper. And finally, the children decorated a hat in aid of Red Nose Day, which then Miss Fuller had to wear on the school catwalk! Woodlands Academy raised £285 in school for Comic Relief, all thanks to their charity 'Fashion Show' and donations from parents! "Aliens love underpants, in every shape and size, But there are no underpants in space, so here's a big surprise..."
This week has been out of this world! On Monster Monday, our classroom was invaded by mysterious creatures. They had 3 toes, 2 legs and left 1 Spaceship...The Aliens had landed!!! Check out the pictures below of our investigation morning. We had to work out who had been in our classroom, and most importantly, why did they leave their underpants?! The Aliens left us a range of fiction and non-fiction texts for the children to enjoy! This was the perfect launch to celebrate World Book Day. This week we also learnt about Tim Peake, he wrote to us and asked if we could build our own Nursery Rocket! We got straight to work and can not believe the results! Once we had our Nursery Rocket, we were ready to fly into World Book Day as the characters from the story, Aliens Love Underpants! Finally, we finished the week off with lots of different learning activities. We wrote to the aliens, using our fingers in the sand, to draw a cryptic messages! Welcome back to the Spring 2 term! We can’t believe how fast the academic year is going, and are delighted that Spring has sprung! We will be celebrating all elements of this season, including thinking about weather, blossom and spring flowers, Easter celebrations and Mother’s Day. We also have lots on, so please make a note of key dates during this term. Please see our Spring 2 newsletter for further information. 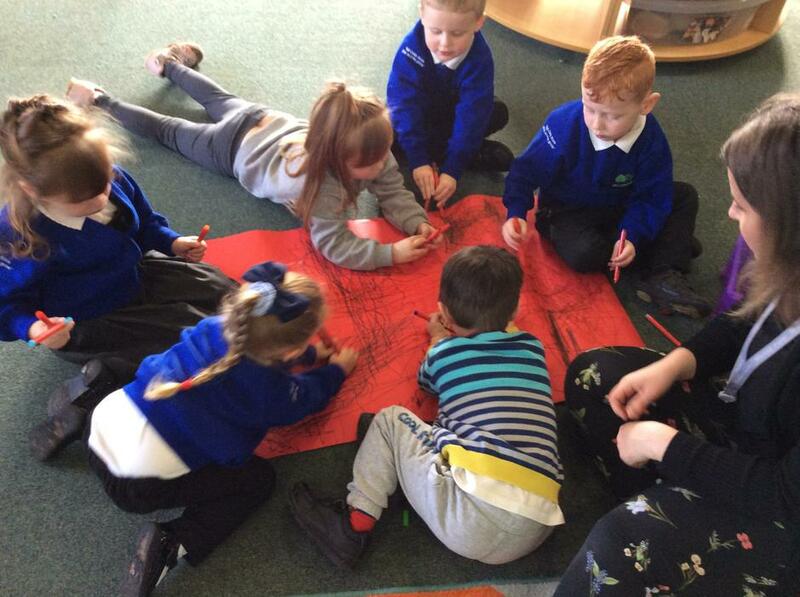 Nursery have been thinking about where we live and what makes our community special. There is a small display in the classroom which we have discussed with the children. Each of them are able to recognise familiar places around us. We are SO excited to launch WBD with our story of the week: Aliens Love Underpants! Look out for a rocket ship crash landing in the Nursery classroom on Monday! Also, please guide your child to have a look in our new, Curiosity Cube. Each week our curious cube will be filled with interesting objects. We are looking to ask the children these main questions to launch learning and capture children's natural curiosity for learning: What can you see? Have you ever seen these before? Do these objects remind you of a story? Where are these things from? Do you think birds know when it's going to snow? We love our new display showcasing the story 'Snowballs' by Lois Ehlert. This is a familiar and loved author of the children as she too wrote 'Leaf Man'. She allows us to explore seasons in an unique way and the children certainly enjoyed making their own snow family! The text also links us to learning about snow, ice, cold, hot and melting weather. All which we use as a platform to build great vocab around the classroom. The story tells the tale of a girl who waits all year for winter. Throughout the year, she eagerly collects the 'good stuff' which is saved and stored in paper bag. When snow finally falls, she brings out the bag of good stuff and builds her own family. Look out for a: dad, mum, boy, girl, baby, cat, dog! 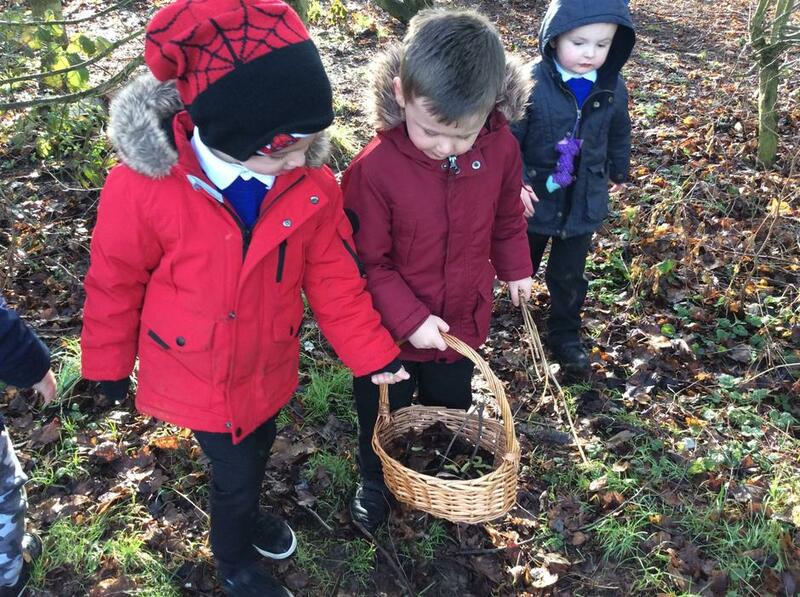 We couldn't resist going on a winter walk and exploring the woodland area for our own 'good stuff'! Below you can see the children collecting different items of nature to build faces and a snow family. 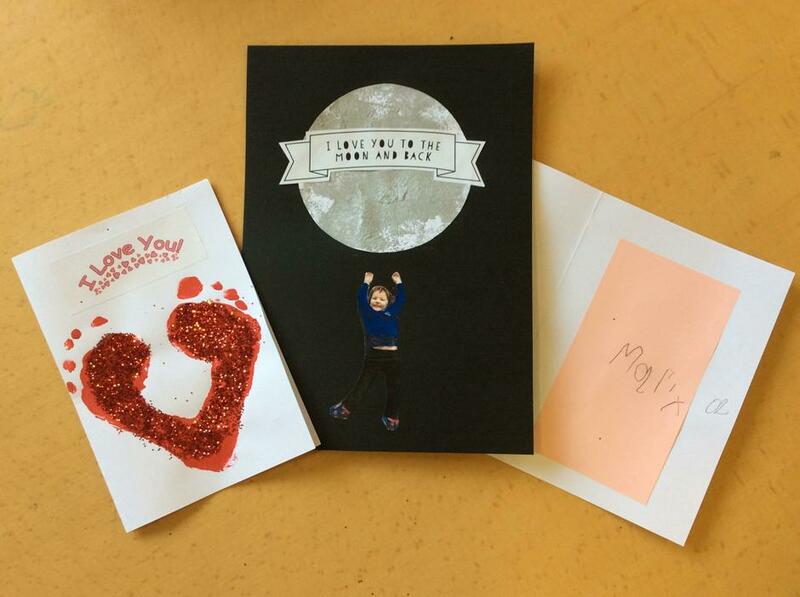 As this week is Valentine's Day, we are also proud to share with you the children's hand made cards and craft. We hope you like and treasure these. This week we have took part in the national Safer Internet campaign which promotes staying safe online whilst providing, tips and advice for parents, schools and children. We know that children learn to use technology from a young age, and we are all responsible for promoting how to use technology in a healthy way - especially when it comes to being online. We used, Penguinpig and Monkeycow as our reading text to help us form discussions with the children around using the internet. Penguinpig tells the tale of a little girl who finds a penguinpig online. She is intrigued by the animal and seeks to find it at the zoo. She leaves the house without telling an adult, she travels to the zoo alone and when she gets there, there is no penguinpig to be found, just a big grizzly bear! She runs home and tells her grown up about what she had seen on the internet. We must be careful and not believe everything we see online! Please monitor your child's activity and help to keep them safe. 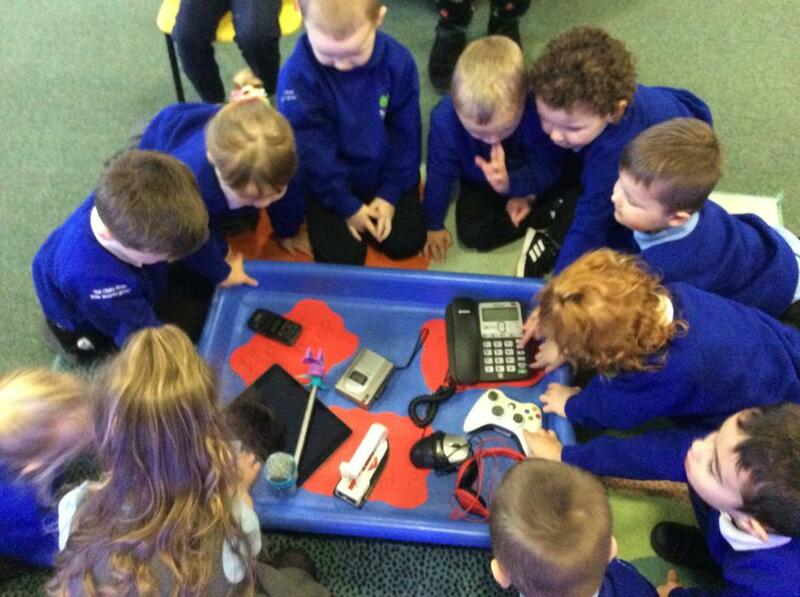 To launch Safer Internet Week, we looked at all sorts of technology old and new. 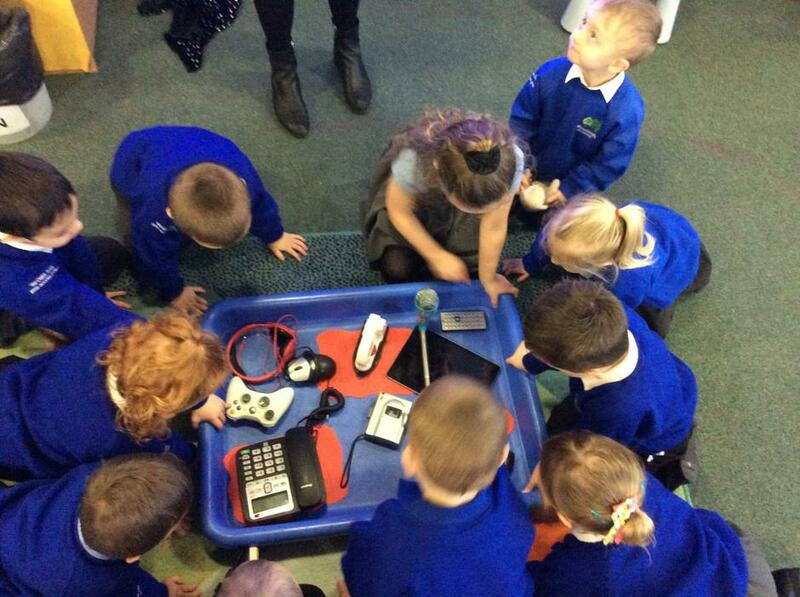 The children had some very inquisitive questions and we learnt about how to use the different equipment. 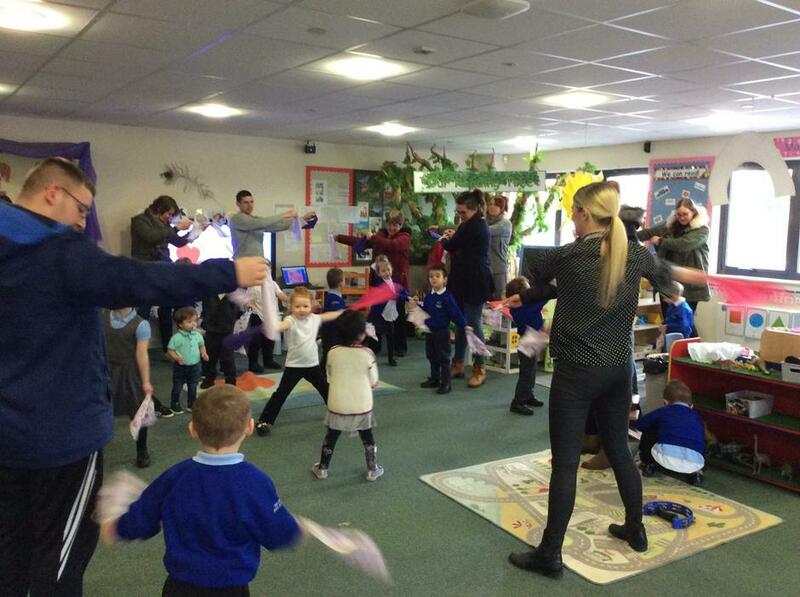 This week we also hosted our half termly, Stay and Play event. The focus of this was to share with you our 'Flapper' Squiggle for Mark Making dance. Once again, the turn out for this was amazing and we would like to thank you all for coming to this event. 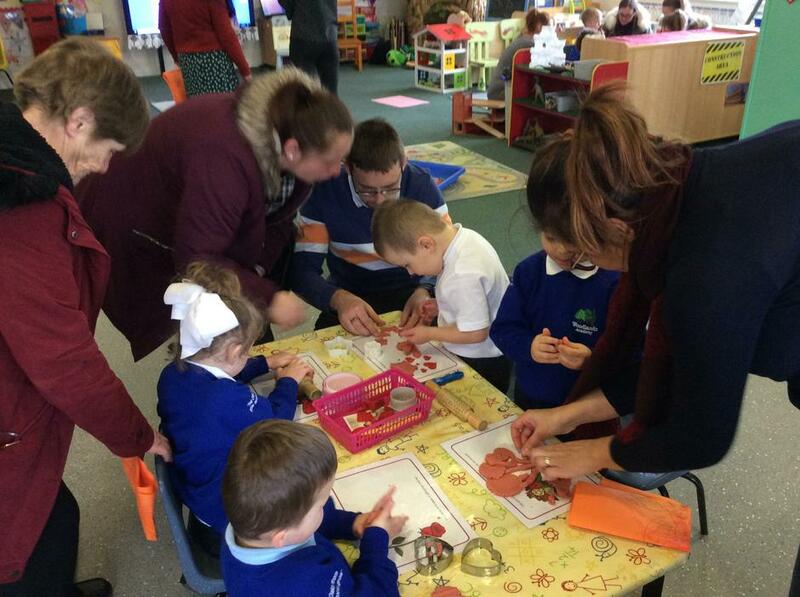 We finished the afternoon with some Valentine's craft, biscuit making, colouring, maths, reading and playdough activities. We have had an incredible week with the children exploring natural worlds and weathers! The weather was on our side too, with plenty of snow, ice, frost and fog - just what we needed to learn and be curious about the Winter season! Alongside exploring the natural world, we used 'Snowballs' by Lois Ehlert to help us understand more about the fictional and imaginative world of winter. We certainly wish we had more snow to build our very own snow family! 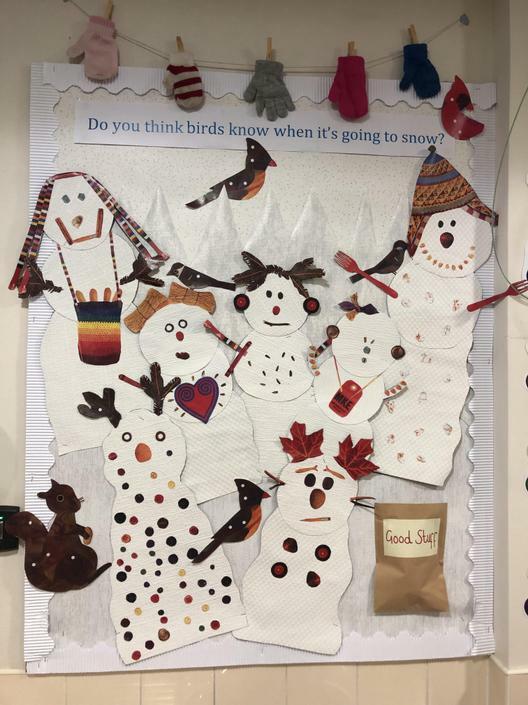 However, we are in the making of creating a snow family display, so keep an eye out for this in our classroom. Below are some pictures we would like to share with you from our week. As you can see, we also discussed or sorted why we need to wear specific items of clothing at different points across the year. This week we would like to share with you our pictures from HAT DAY! Hats have been in the world since at least 3000 BC, as an image of a man wearing a hat of straw was discovered in a mural from that time. Since then, hats have served some incredibly diverse purposes, from simple protective wear to help those stuck out in the rain, cold, or hot sun, to indicating status and rank. Hats have undergone an immense amount of changes, with varieties appearing all over the world in every possible culture. Whether for the soldier protecting his skull from incoming damage, the lieutenant making sure that his troops know where to look for direction, or the dapper gentleman in the Top Hat on his way to the opera, everyone has a love and use for hats. Hat Day is the best time for you to break out your favorite headwear, and use them to make a huge impression. The children have been able to describe main story settings, events and characters in our story of the week - Goldilocks and The Three Bears. 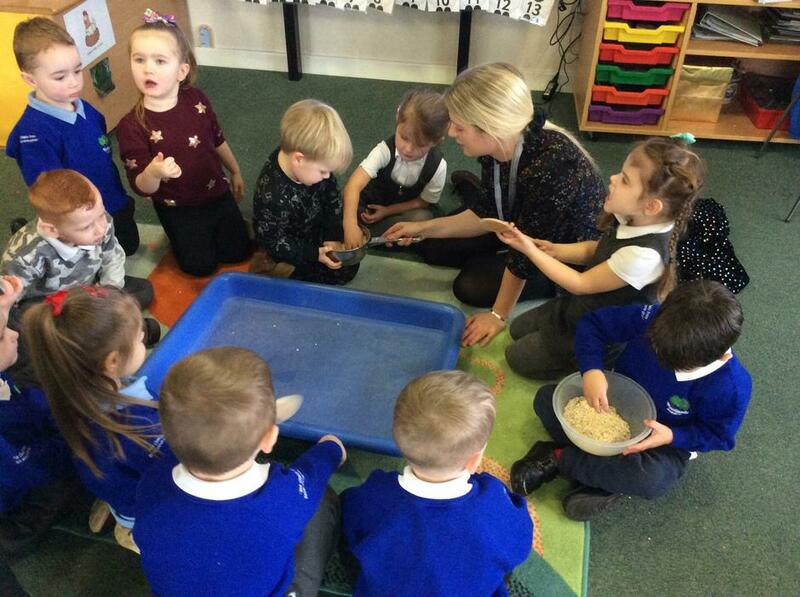 We have also enjoyed a sensory experience of the story and used our hands to feel and describe the texture of porridge oats before adding water to make thick sticky porridge! 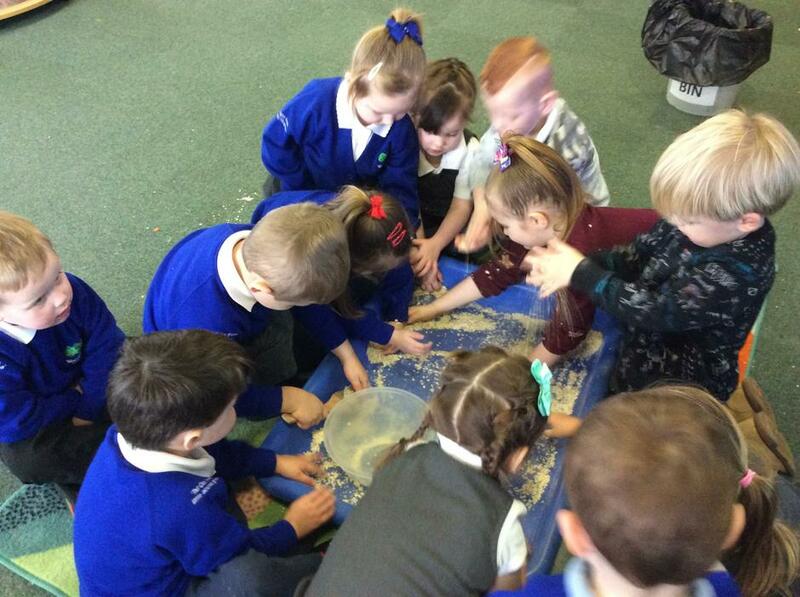 The children loved getting their hands dirty. 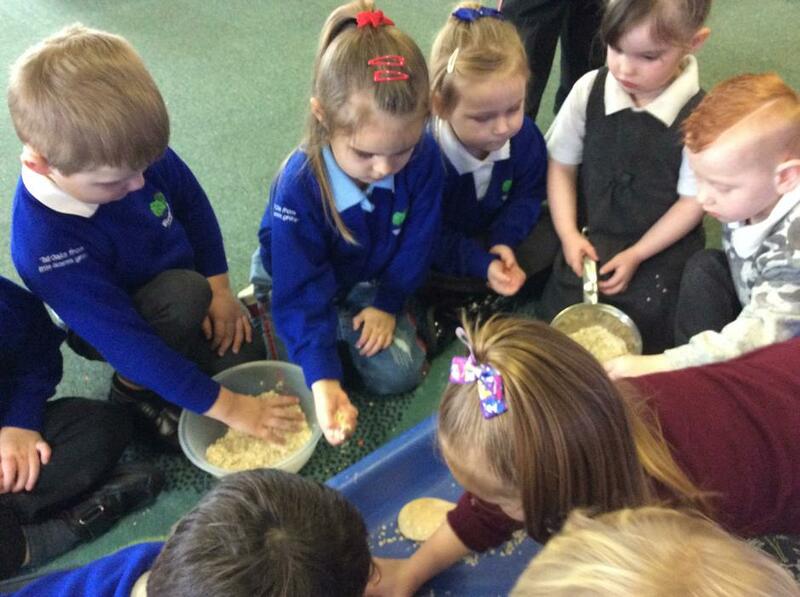 Goldilocks had plenty of porridge in our classroom - that is for sure! We have also used this text to be able to compare and contrast different textures. Daddy Bear's chair is hard, and Mummy Bear's chair is soft. We decided to sort objects found in our classroom into hard and soft. To do this we had to feel the object and describe how it felt. We will be continuing with Goldilocks and The Three Bears. We hope you had a wonderful Christmas and New Year and welcome you to the Spring Term! 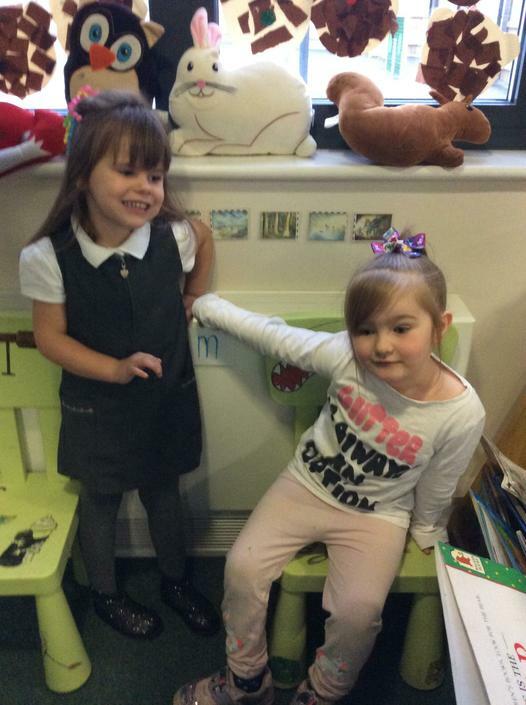 We have been very lucky to welcome some new friends into Nursery. All the children have been so kind and caring towards our new starters which has made their transition into school life so much more comfortable! We are pleased with how settled our new starters are already! Due to the success of our Read and Stay, and our Christmas Craft session, we are now holding another Stay and Play event. This is a great opportunity for you to come into school and learn with us. Children also value the time and effort that is given to them when you stay at these events. It has been so lovely to see you all connect during these times. 5th February – Safe Internet Day. This term our topic is Fairytales. From 14.01.19 we will be exploring Goldilocks and The Three Bears. We know the children are already familiar with this story, but are excited to explore the story deeper, and work with the children on the topic of strangers. We are also going to have a porridge tasting session! We will also explore different mediums of the story such as – books, big books, songs, video, and puppets. Children can bring in a labelled water bottle to school each day. Please ensure this contains only water as no juice or fizzy drinks are allowed. And just in case, it is always a good idea for your child to have a spare change of clothes in their schoolbag. This week we have had lots of fun, eaten lots of chocolate, and remembered the true meaning of Christmas - family time and spreading joy. We are super proud of our Gingerbread House - made from scratch!! It smelt delicious and tasted amazing! 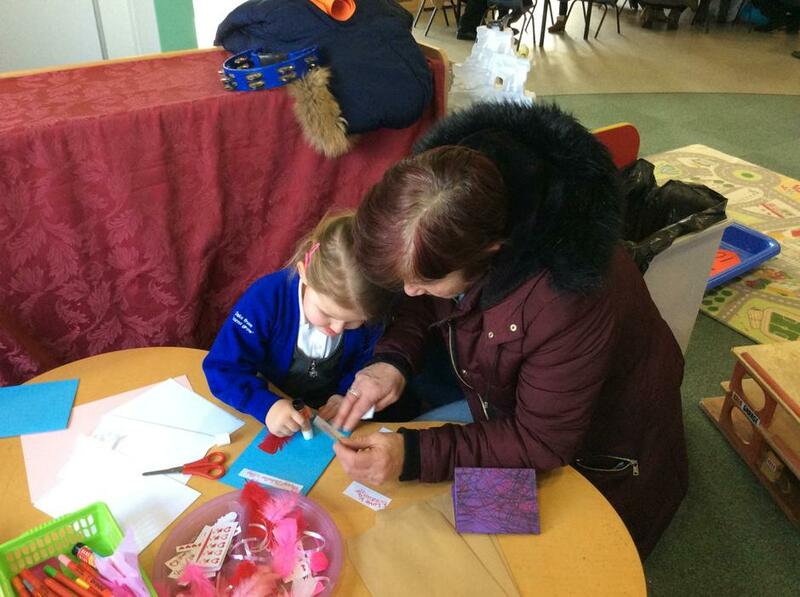 The children have also been busy making Christmas crafts. Your child will bring home, a Christmas salt dough decoration; a Stickman Calendar; a kindness letter with your child's handwritten name and a keepsake photograph of your child in Santa's sleigh. We hope these are as special to you as they are to us! Firstly, we would like to thank each and everyone of our Parents, Carers, Grandmas, Grandads, Aunties and Uncles, for making this day so special. Without you, our concert would not have flourished so brightly as it did! The children have worked incredibly hard to practise their concert songs. Each child has enjoyed singing with their friends and was very excited to share their singing with the grown ups. We sang: Christmas Pudding, Twinkle Twinkle Little Star, Jingle Bells and We wish You A Merry Christmas! 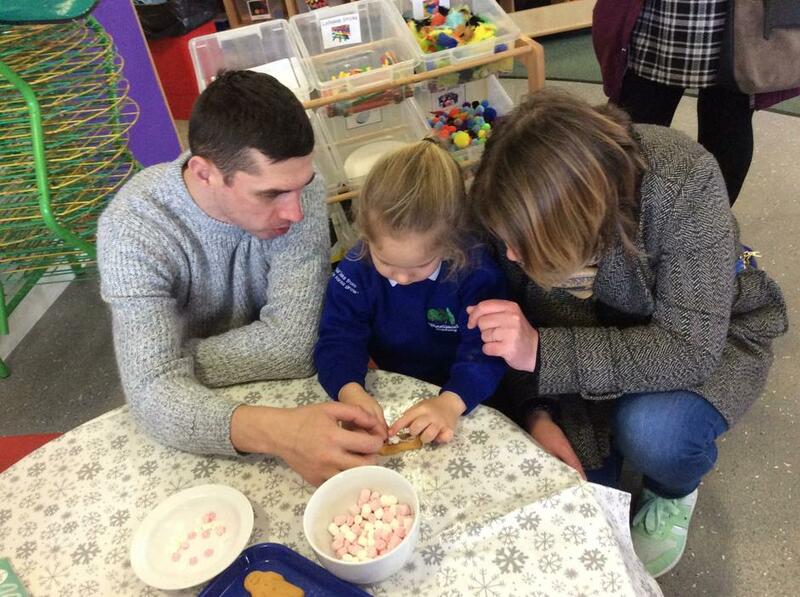 After our songs, each family went off to make a Christmas craft with their child. 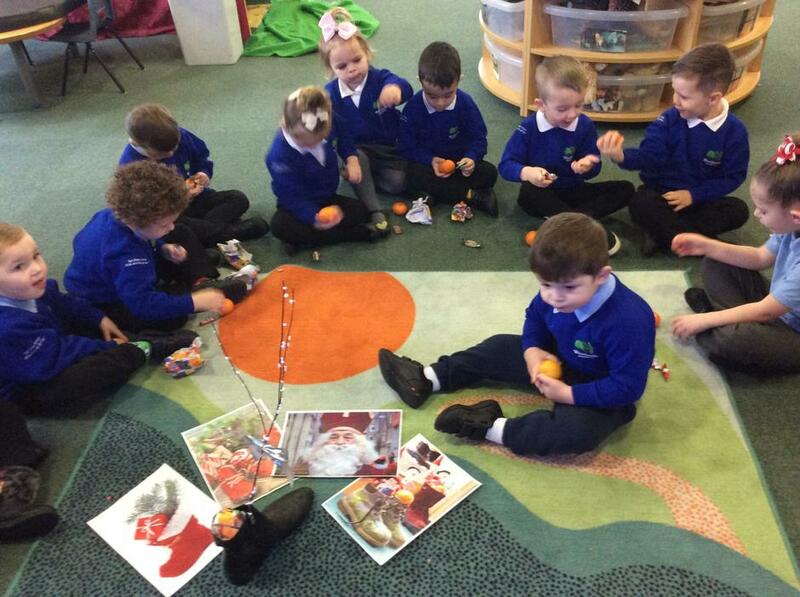 We shared mince pies and juice, then read a Christmas story. This week we were very lucky to have another visitor in school to talk to us about a special tradition that happens in Romania. Each year on 6th December, children will polish their best pair of boots and leave them next to a fireplace or front door. When the children wake up, they will find small gifts in the boot, delivered from Saint Nicholas. Gifts can be small toys, fruit and sweets. Traditionally, some children may receive a stick, decorated with ribbon and beads. This is given to children who are not deserving of toys and gifts in their boots. The children enjoyed finding out about different cultures and they also received a gift of chocolate and fruit. 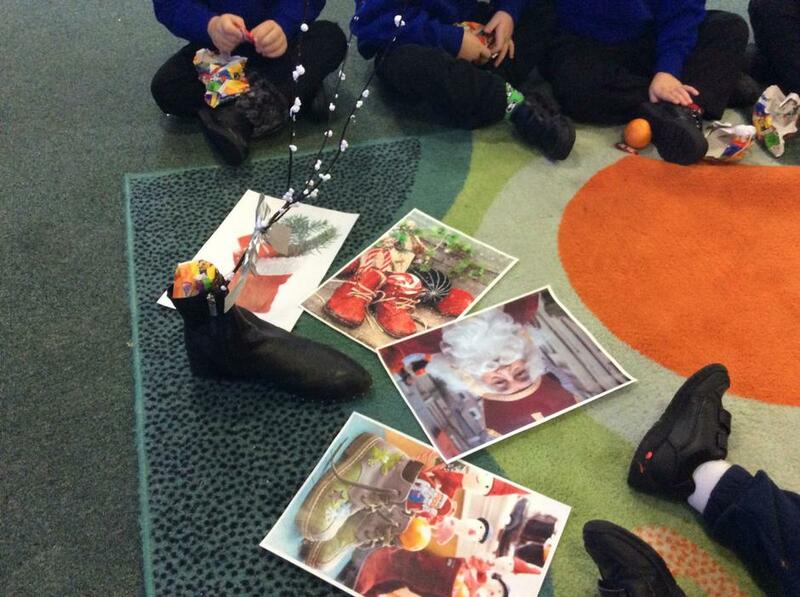 We looked at pictures of Saint Nicholas and talked about his similarities to Santa Clause. We also looked at pictures of boots filled with gifts, and our visitor brought in a decorated stick - just so the children could see! We also enjoyed our Story of the Week - Mog's Christmas Calamity. We went into the Atrium and sat next to the HUGE Christmas tree and Santa's sleigh. This story provokes us to think about Christmas kindness and joy. We hope the children understand the messages of sharing and helping one another. This week was our Road Safety Week. The children have been learning all about how to keep safe near roads and what they can do to keep safe when riding a bike/scooter. We showed the children how to properly wear safety equipment such as a helmet, elbow/knee pads and high visibility jacket. They loved this practical activity and could identify the reasons why we need to use such safety measures. 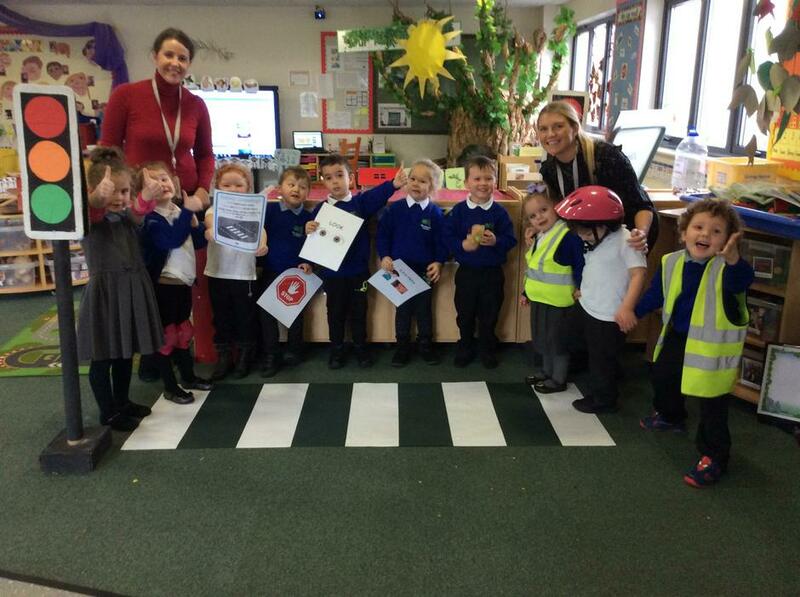 We were also lucky to have members from N.E.Lincs council come into school and talk to Nursery about road safety. We are very proud of the children's participation in this. They all had great ideas to share for discussion! They enjoyed more practical activities of walking over a zebra crossing. The council also gave us a gift - Safety Sam. He is a small teddy bear wearing a safety jacket to remind the children about how to keep safe. He is in our classroom for the children to play with. For more information on road safety, please see the link below. You will find help resources specifically for 3 - 6 year olds. Talk to your child about what they have learnt at school, and remember, never let a child cross a road on their own. Always, STOP, LOOK and LISTEN. The weather has turned, dark, cold, and gloomy. It has also been foggy! Perfect for us to teach our story of the week, The Foggy Foggy Forest! This book has enabled your child to explore rhyme. It is important that your child listens to stories and poems so they can show an awareness of rhyme, and recognise rhythm in spoken words. We went on an adventure to the woodland area and explored our story whilst sat in the fog. To help us understand rhyme and rhythm, we sang the words in the book: What can this be in the foggy foggy forest? 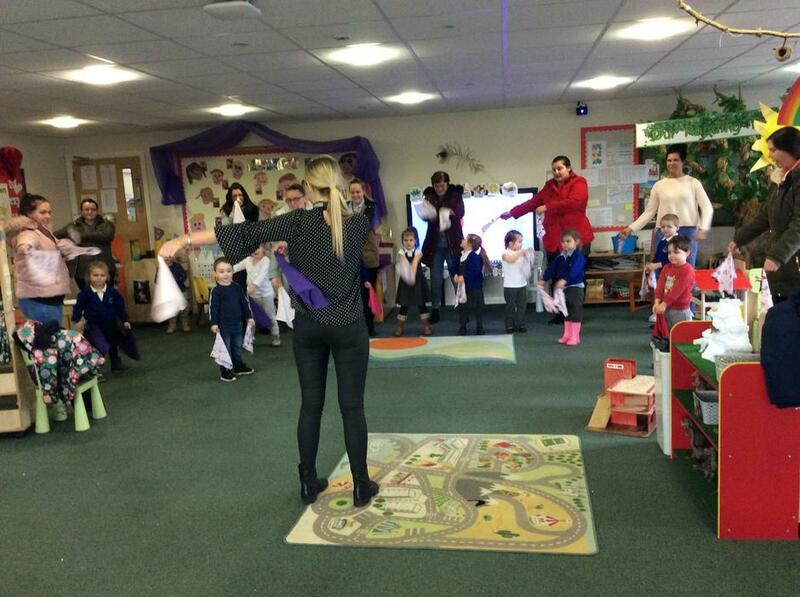 The children particularly liked - An ogre doing yoga!! An ogre is now in our classroom, next to our good sitting chicken! 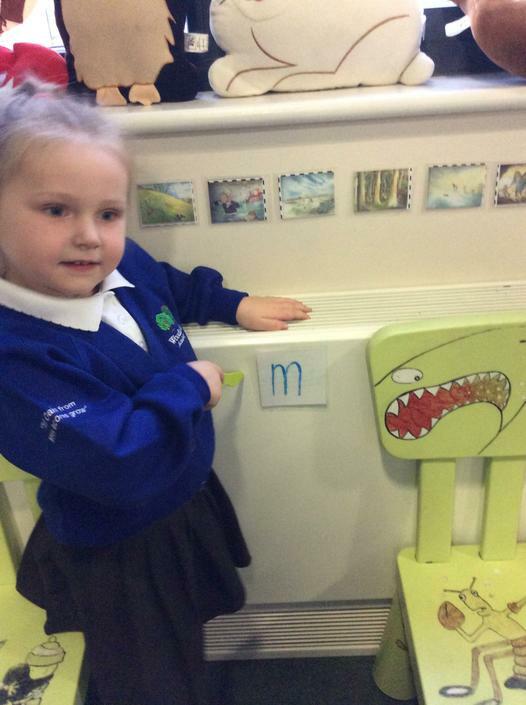 We have recognised that many children in the class are beginning to hear initial sounds in words and certainly, the initial sound in their name. This has lead us to play sound games and teach the sound 'm' (pronounced mmm). 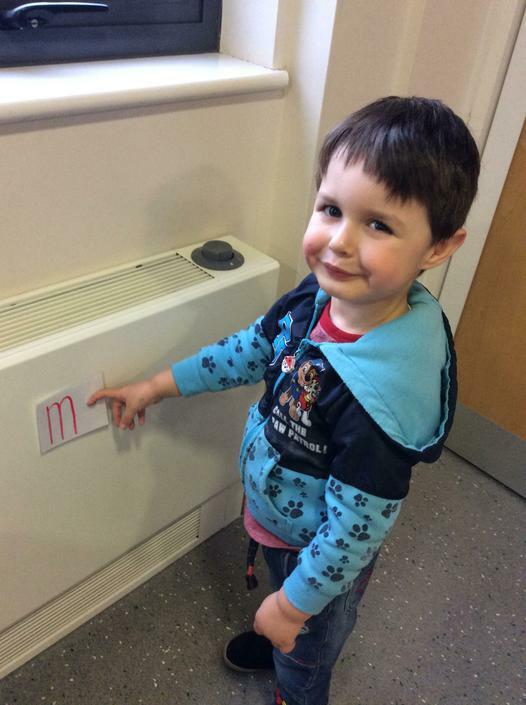 This is the first sound to be taught from the Read Write Inc, synthetic phonics programme. The children were engaged by our sound bag game, we found these objects that start with 'm': mirror, monkey, magicwand, magnet, mouse. 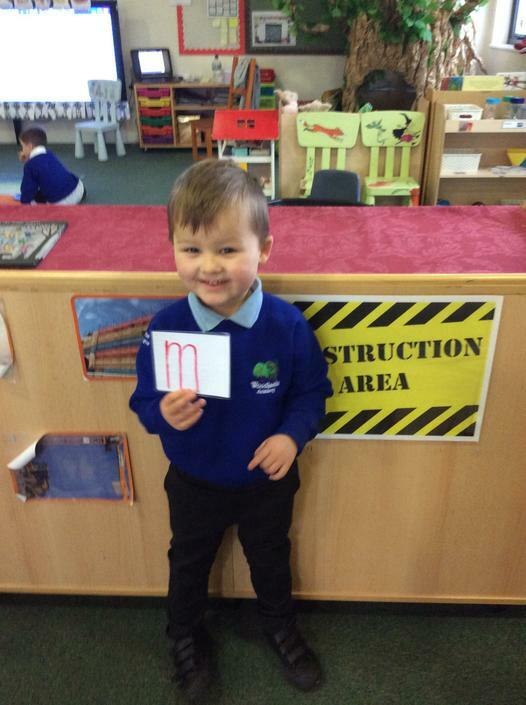 Throughout the week we hid 'm' letters around the classroom. 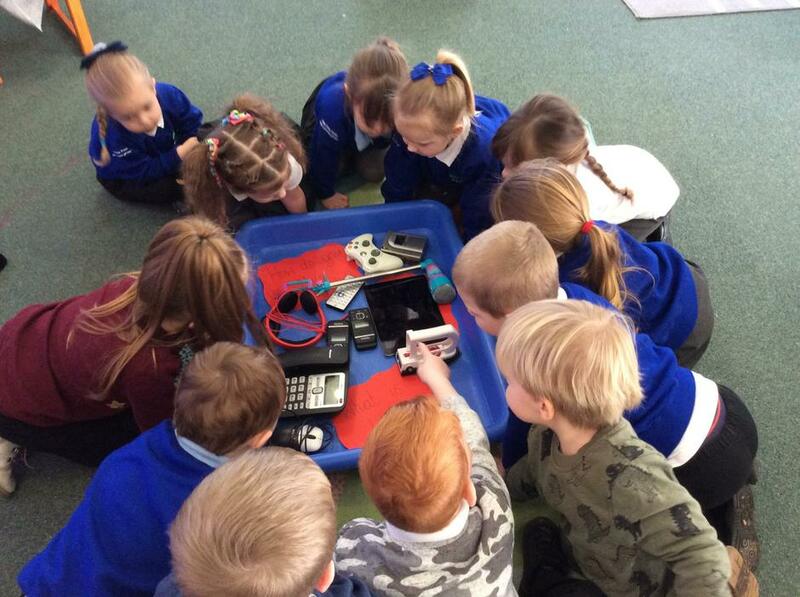 Each day the children were very excited to show us what they had found. We have a very special guest coming from N.E.Lincs Council, to talk to the children about how to keep safe near roads. Before children are able to write, they need to be physically developed. We are excited to share with you that this week, we have begun Squiggle Whilst You Wiggle! 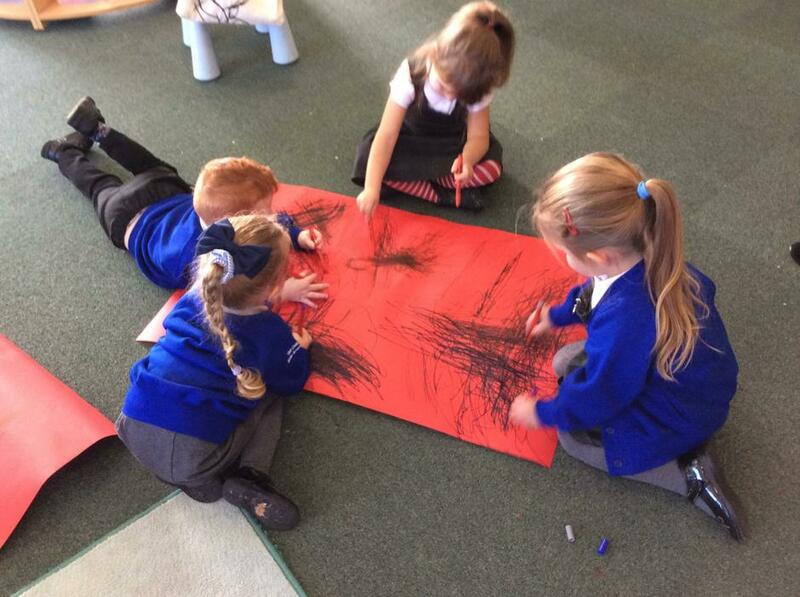 This is an early writing programme which uses gross motor movements to draw lines and circles. 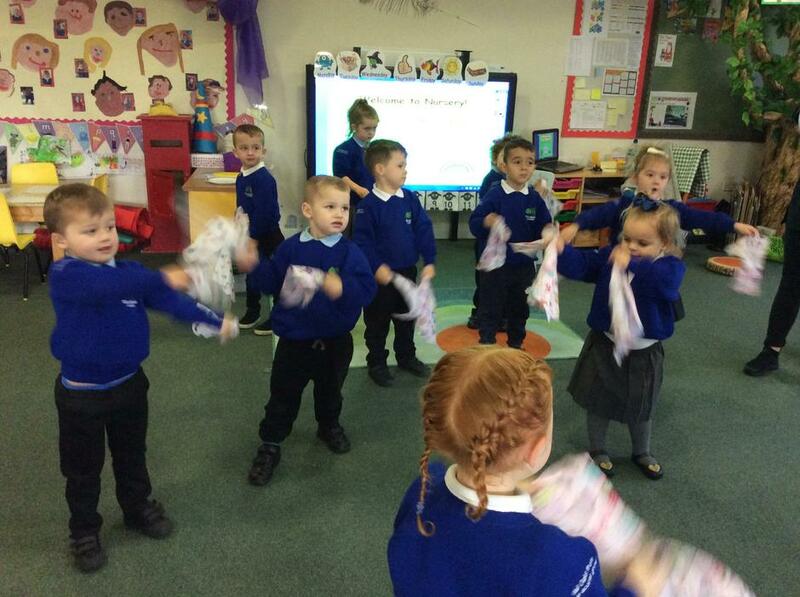 We use our flappers to help us create lines and circles in the air. 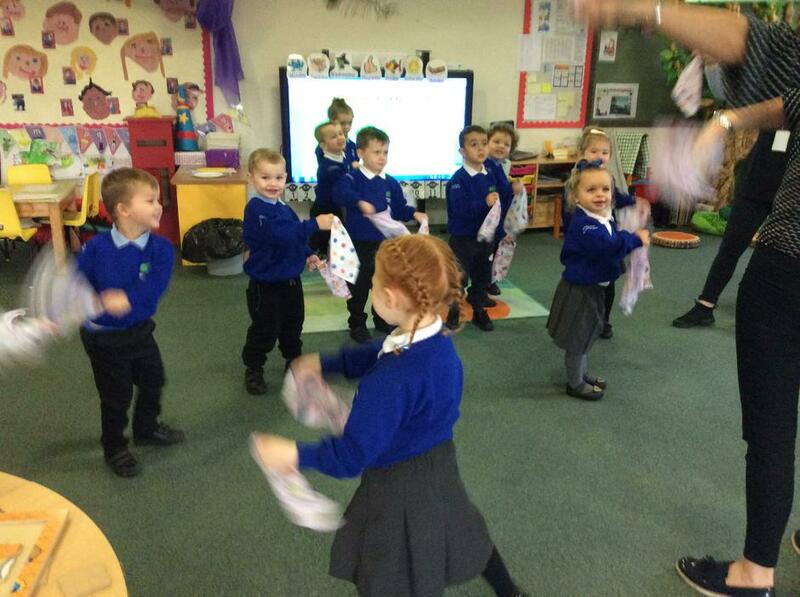 We put some funky music on to help us express our movements. Ask your child to show you these movements at home! You could even take a picture to show us! When we have finished with our flappers, we draw out the dance! Your child will hold a thick pen in each hand and draw the same movements onto paper. This supports their development of writing lines and shapes. We would also like to thank you, for the fantastic effort that you went to for Children in Need. The children had a great day, and we were able to discuss how we can support other children less fortunate than us. 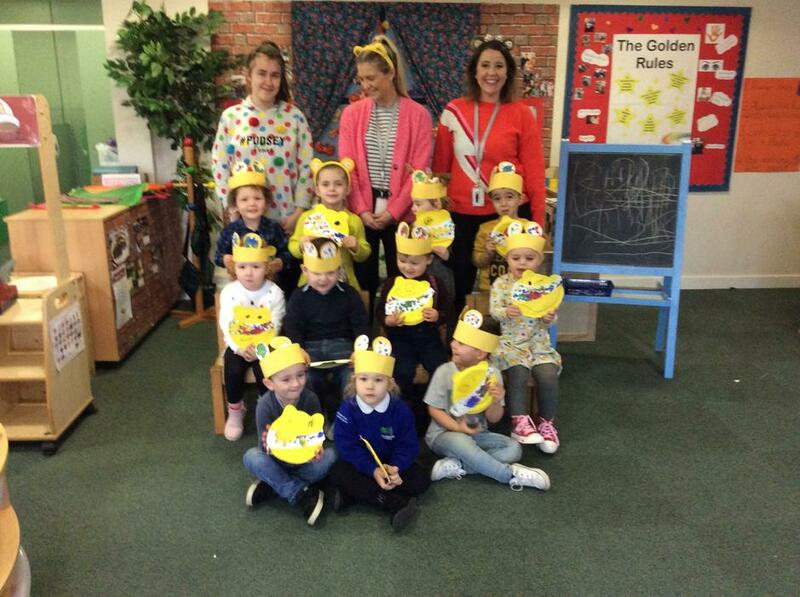 The children also enjoyed our Pudsey craft, they each made a Pudsey headband and Pudsey face. This week has been super busy! We’ve learnt about, Guy Fawks day, Diwali, and Remembrance Sunday as well as our book of the week, The Tiger Who Came to Tea. Our classroom even has its own Café area for the children to role play scenes from the book! BaNg, PoP, FiZz, BoOm, WhIZz, WeEeE, CrAcKlE – we love firework vocabulary! Come and have a look at our firework display. We used brushes to manipulate different effects with paint, on black paper, then used our fingers to pinch glitter and sprinkle it onto our work. Wow. We also wrote numbers in powder paint, this was very fun and exciting! Our children know that each of our red poppies help us to remember the soldiers who have helped us. They took lots of care and pride when making our memorial piece. The Snail and the Whale - check out our new under the sea, small world area. We use our ‘story of the week’ to enhance the children’s learning. Make sure you take a look at our story board, to keep up to date with the different literature we use. May we also remind you to ensure your child comes to school with a drinks bottle (filled with water only) and a spare change of clothes. As part of our free flow provision, the children are able to access the playground at all times. During wet and cold days, we provide wet weather gear for the children to use. 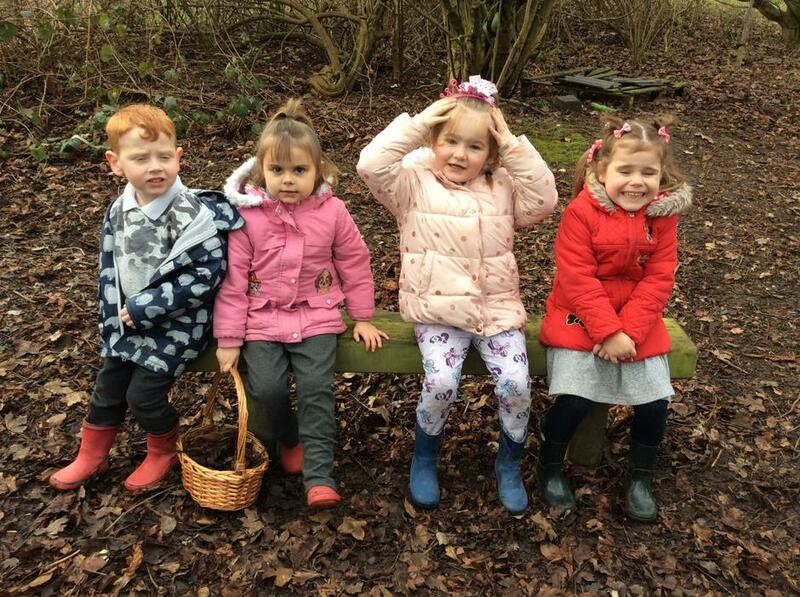 To ensure we provide a variety of learning opportunities, once a week we learn in the woodland area… your child may talk to you about the Gruffalo in the woods! Ted, our class bear, will continue to be taken home this term. We know how eager the children are to take him home and thank you for waiting so patiently if he hasn’t been to your house yet. 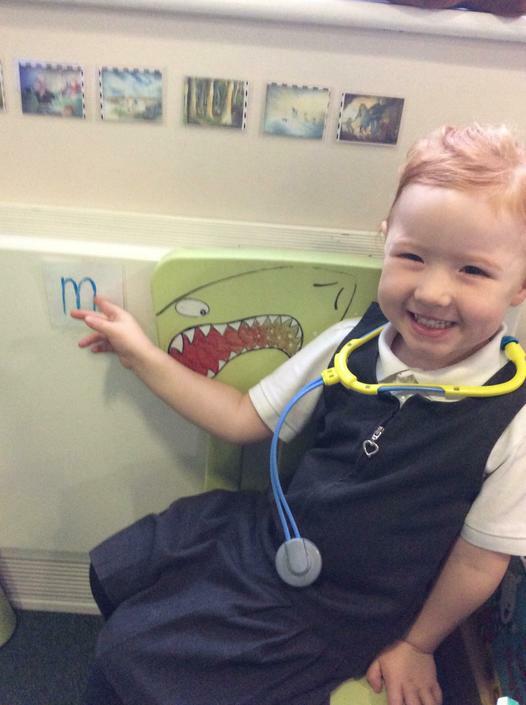 Finally, we have fantastic readers in Nursery! Each Friday, the reading record box will be displayed for you to hand in your child’s reading record. This will be checked. After every 5 reads, your child will receive a sticker and prize from our treasure box! If you have any book requests for home learning, please let one of the Nursery team know, and we will try our best to accommodate you. There are some unexplained happenings in Winnie and Wilbur's house. A smashed vase, collapsing curtains, and a shattered chandelier. Could it be haunted? Please see our Winnie and Wilbur display board for more information and pictures of spooky week! In our final week before half term, we continued learning about Autumn and other seasons that occur during a year. We talked about the natural word, and things we have observed such as plants and animals. We were also able to develop an understanding of growth, decay and changes over time. 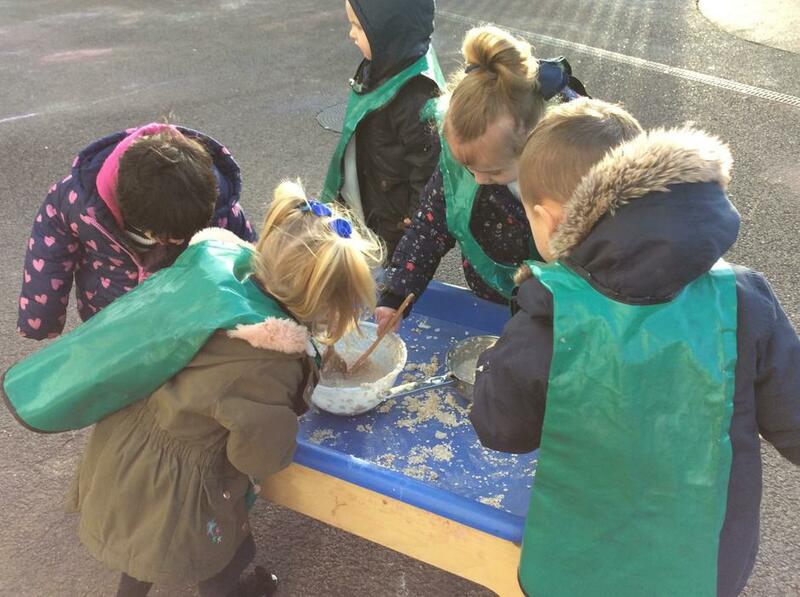 Building communication and language skills are at the heart of the foundation stage curriculum. We use fiction and non-fiction texts help us provide rich and varied vocabulary so the children are able to learn new words and use them in their play. These are the necessary skills which will support your child throughout their time in school. From our discussions around seasons, the children used their imaginative and creative skills to create a beautiful autumn card and make a chocolate birds nest – yum! It was great fun to use the school’s D.T room to look at the shape of a chocolate bar and understand how it can change. 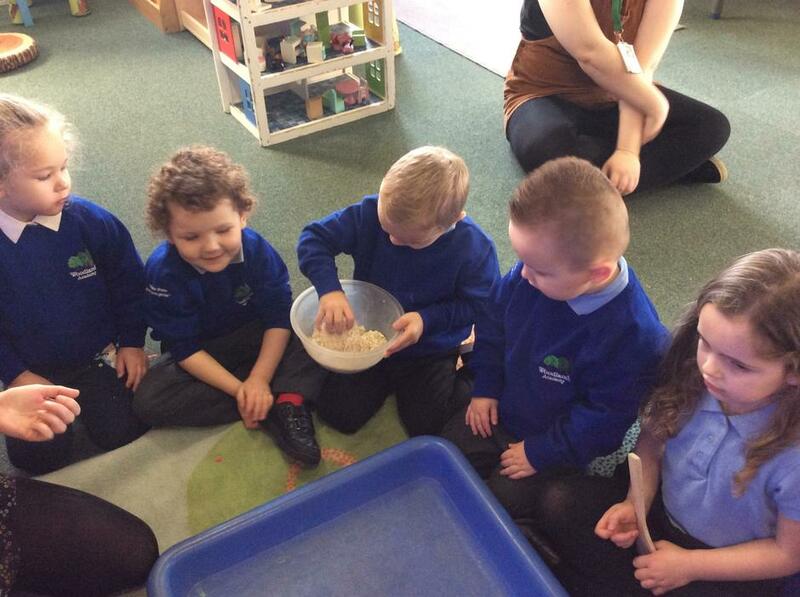 We then mixed our melted chocolate with cereal to make a birds nest. The children have worked incredibly hard this term, and we could not be any more proud of them! 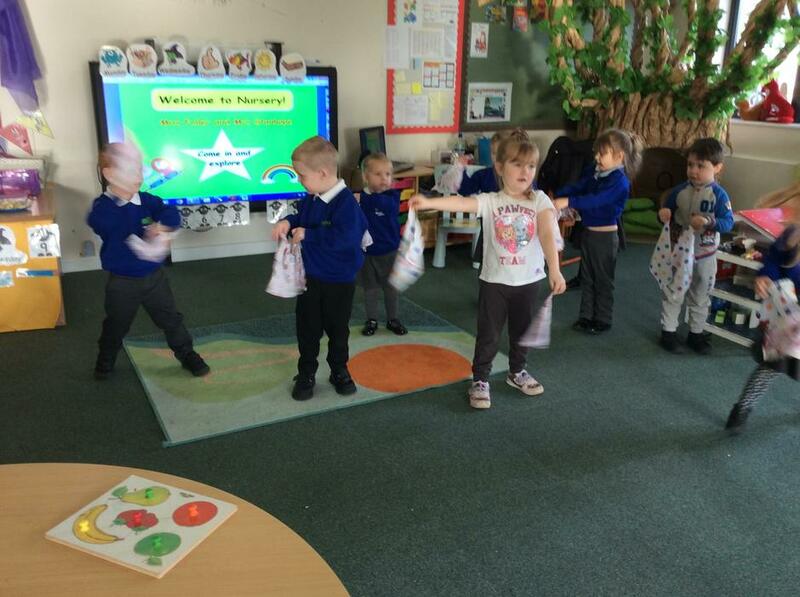 We have also welcomed lots of new friends into our nursery and are delighted to grow our classroom community. Thank you to each and every one of you who have had the chance to take Ted, our class bear, on an adventure. We are overwhelmed with the effort that parents/carers have made. It is lovely to have a journal of the children’s home learning. Ted will continue to be taken home after the holiday. Enjoy the half term break and we will see you Monday 29th October ready for SpOoKy week! Where does a Leaf Man go when the wind blows? We have been able to use our story of the week, Leaf Man, to help us understand about the world around us. We’ve looked very closely at the details of our autumn treasures. 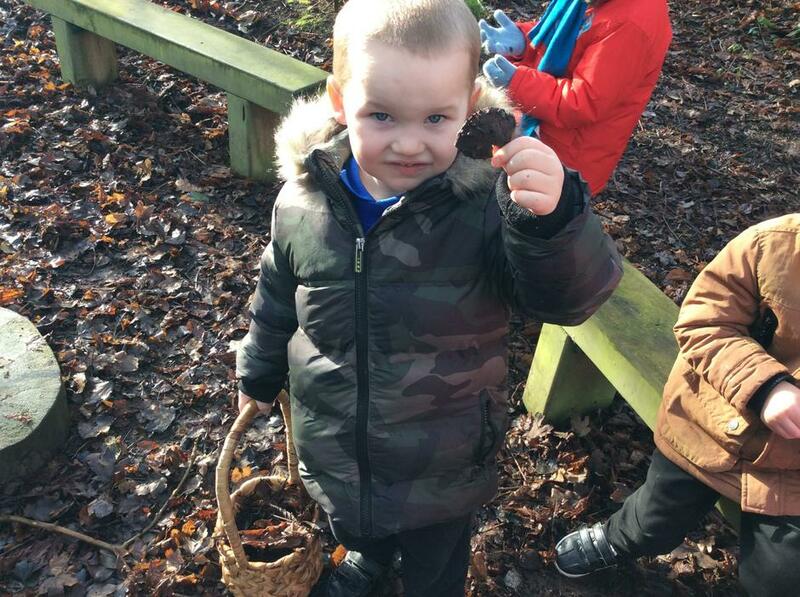 Conkers, pinecones, acorns and pumpkins are among some of the children’s favourite. This has also enabled us to think about the different sounds and textures that autumn brings. We sat with our eyes closed, and listened to the howl of the wind. We could also hear chirping birds and a grass cutter! We felt the crunch of the leaves in our hands and could hear the rustle of them on the ground. The children were so immersed in the tale of Leaf Man, they even laid down on the cold ground and felt what it is like to be a leaf! Where a Leaf Man will land, only the wind knows. So listen for a rustle in the leaves. Maybe you’ll find a Leaf Man waiting to go home with you. Autumn craft and bird nest making. 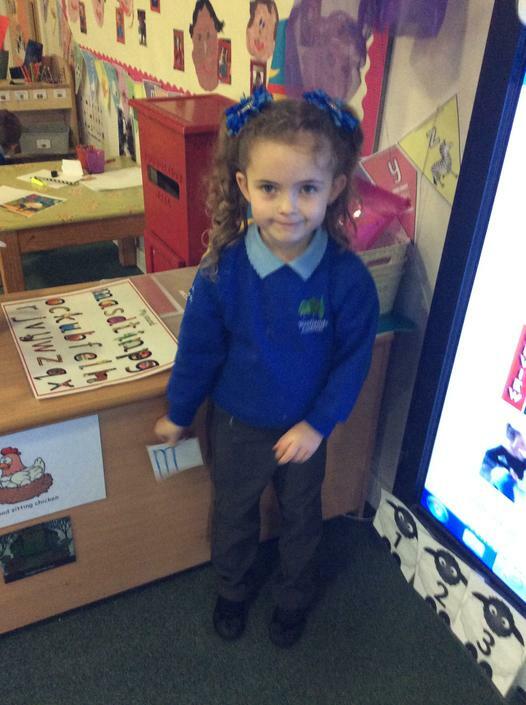 This week was a very exciting one in Nursery! 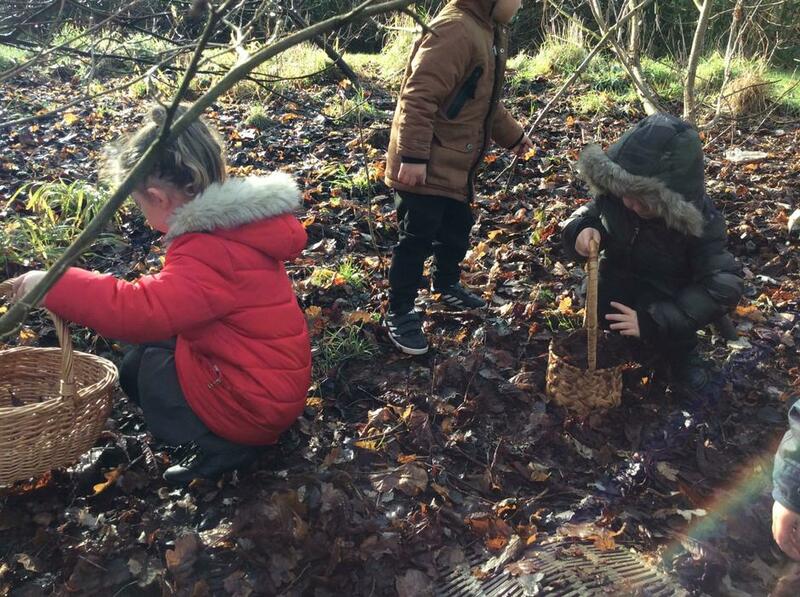 Our class fairy left a letter telling us about a mysterious object in the outdoor classroom… something round, white, hard, smooth and sitting on top of a nest! The children used their detective skills to decipher the clues and were thrilled to discover that it was indeed an egg! BUT… whose egg did it belong to? There were more clues! Someone with sharp claws, two large wings, red scaly skin and breathes fire! It was the dragon Zog from our story of the week! Zog is the keenest dragon in school. He’s also the most accident-prone, flying into trees and even setting his own wing on fire! Luckily, a mysterious little girl comes by and patches up his bumps and bruises. 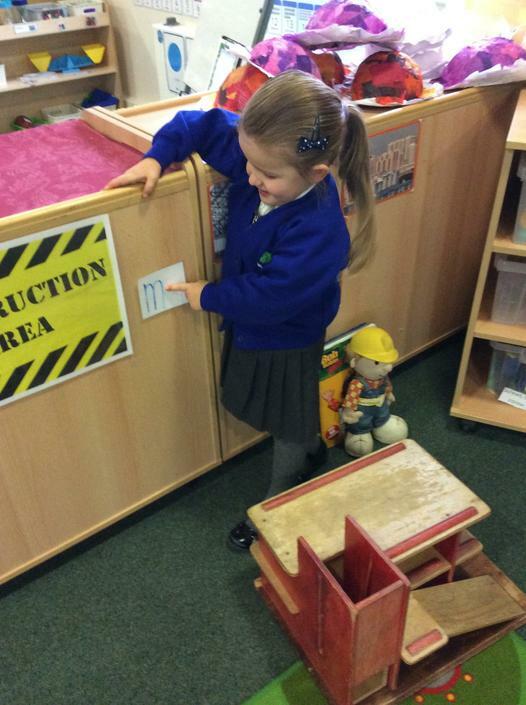 The children have been building their literacy and developing their vocabulary on our story walk. 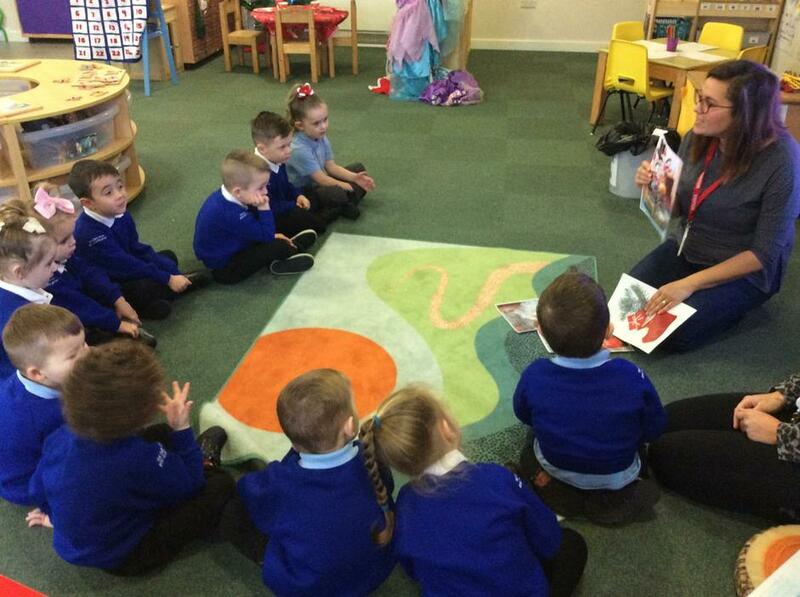 The children particularly enjoyed going to dragon school; just as Zog does in the story! In the same way as the little girl Pearl in the story, the children have been fixing bumps and bruises in our new doctor surgery. 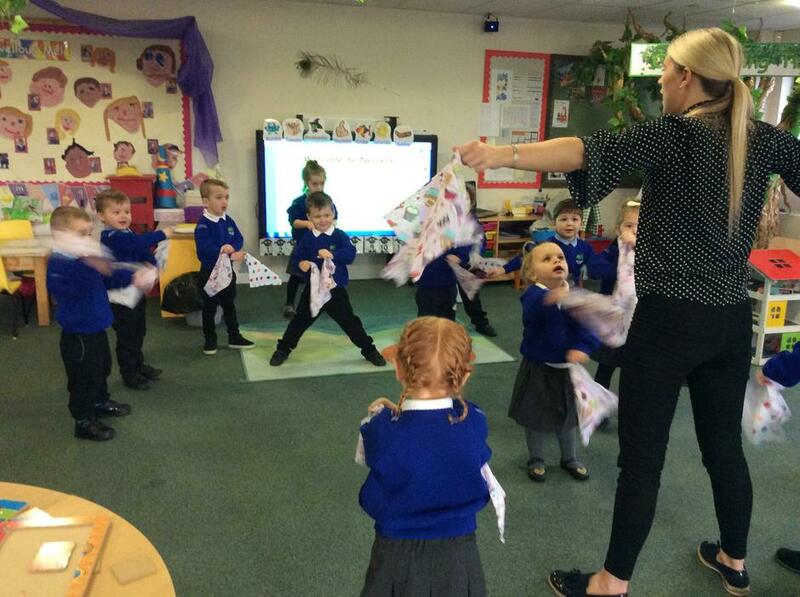 We have also enjoyed singing Miss Polly had a Dolly. By participating in dramatic role-play, the children are able to gain in confidence in relation to their own medical experiences. NEXT WEEK… our focus story will be Leaf Man by Lois Ehlert. 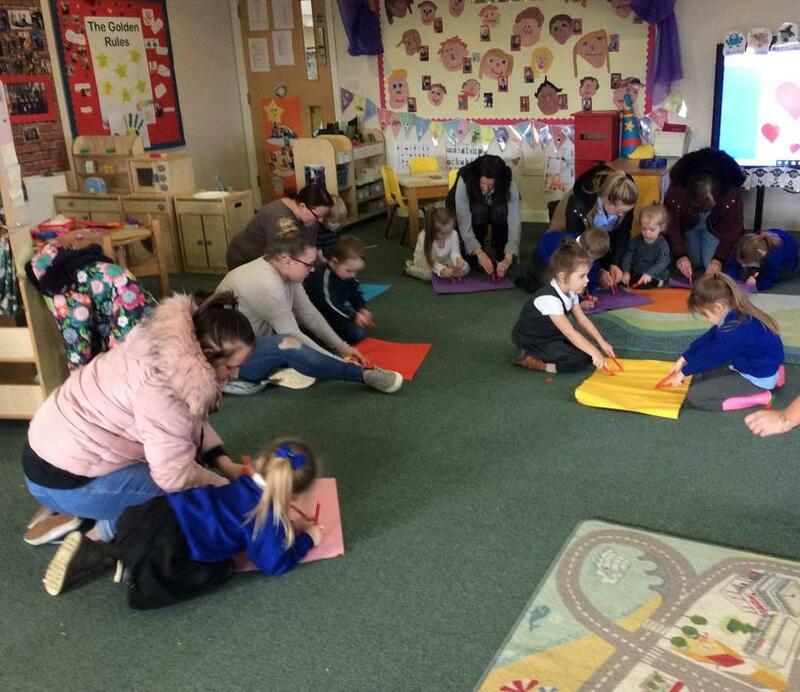 We would like to start by saying a great big THANK YOU to all the parents who attended our 'Stay and Read' session this week. The children have worked so hard on their performance and we know how special it is that they were able to share their work with you. We hope you enjoyed it as much as we did... But don't worry if you couldn't make it. There will be plenty more! 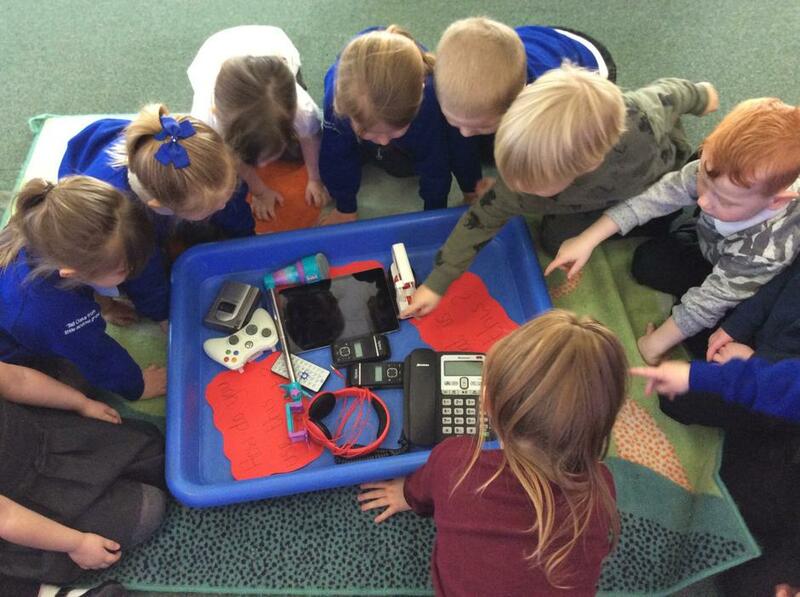 This week there were some mysterious objects left in our classroom. The children became detectives and had to investigate who had left the clues. We used all our senses to think about how we could describe these clues, to help us understand where these objects came from. Can you guess who had been? We're Going on A Bear Hunt by Michael Rosen is one of our favourite books in Nursery. Throughout the week the children have enjoyed lots of bear hunt related activities. They particularly liked creating their own bear to go on display in our reading area! 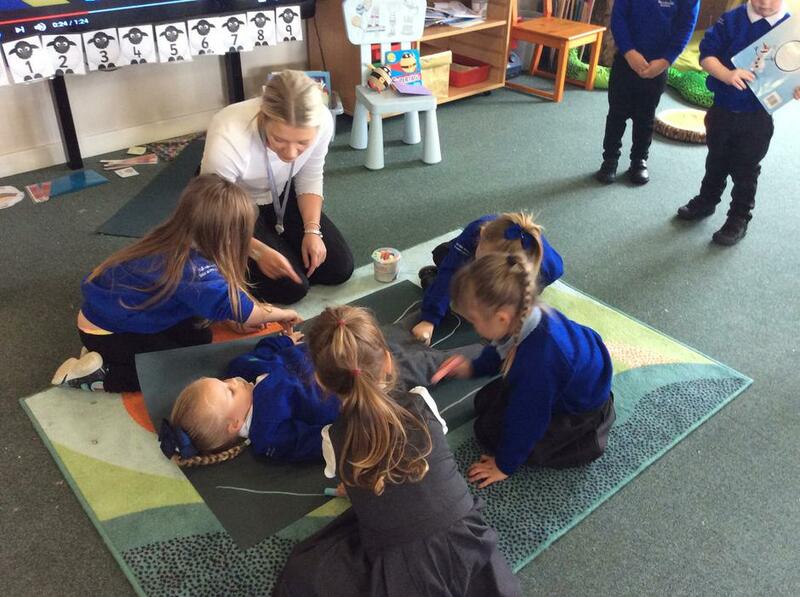 This week in Nursery we have been super busy learning all about what makes our bodies special. We have looked at all the different body parts and discussed what we can do with each part of our body. For example the children said, "I can run with my legs, I can talk with my mouth." We were so eager to show our grown ups what we had learnt, we made a body part display. We then looked closer at the details of our body parts that feature on our face. 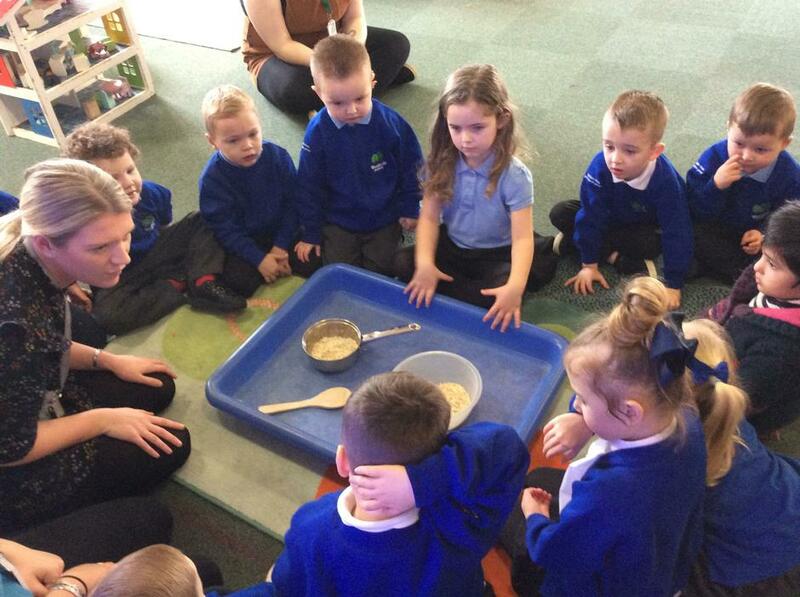 The children used mirrors to look closely at their eyes, nose, mouth and hair. We had some great discussions about the different shapes on our face. We were able to make our 'Marvellous Me' self-portraits, that we are super proud of. Our self-portrait paintings inspired us to use a range of mark making resources in our writing area. The children used crayons, felt tips and coloured pencils to add features to blank faces. 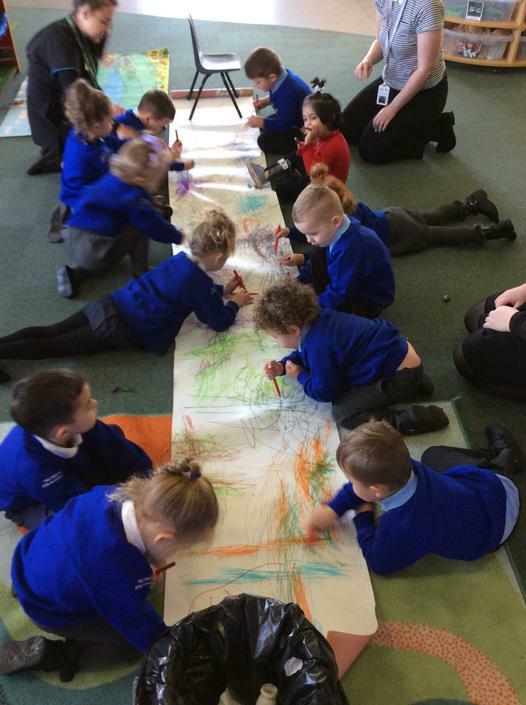 We are lucky to have such fabulous artists in Nursery! The children have loved learning about themselves and others in the world around them. 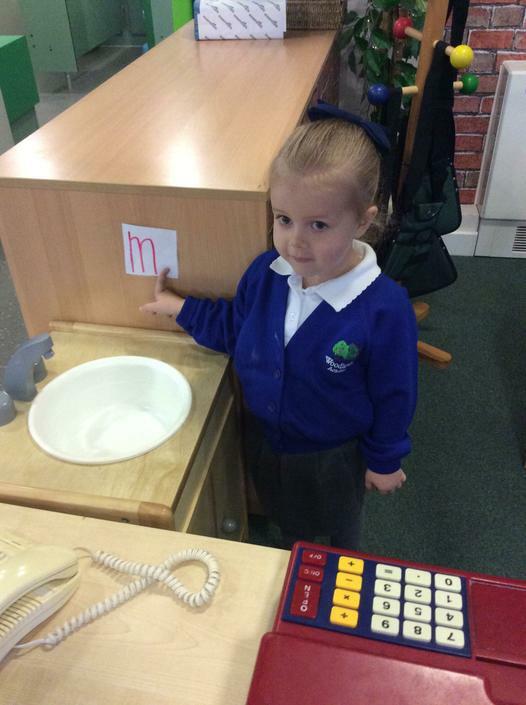 We also hope you enjoy your child's 'First Week in Nursery' photograph letter. 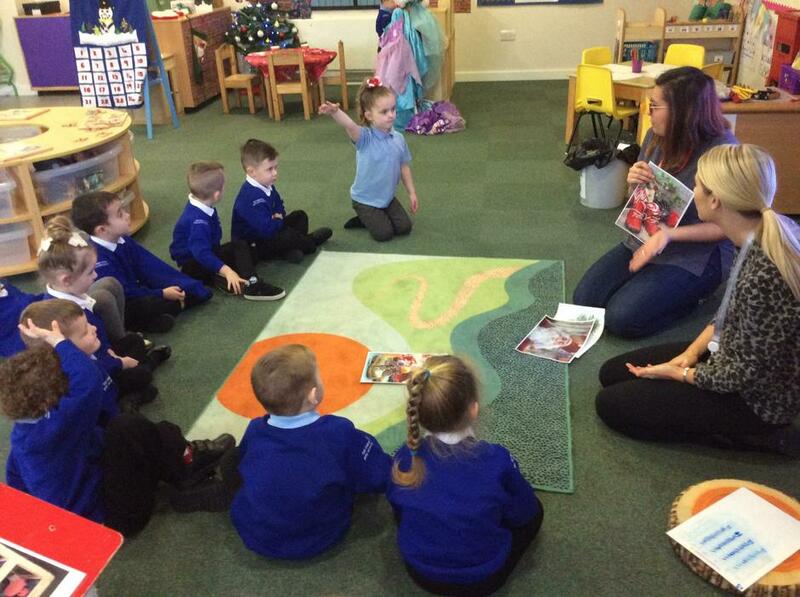 We look forward to having the grown ups in school with us for our 'Stay and Read' sessions. These will be at 8:45am and 12:15pm on Thursday 27th September and last around 45 minutes. We also have a very special book related performance from the children! See you there! Let's introduce ourselves: we are Miss Fuller and Mrs Stanhope! Welcome to our Nursery page. We will keep this page updated weekly with lots of information about what we have been learning and other key information! 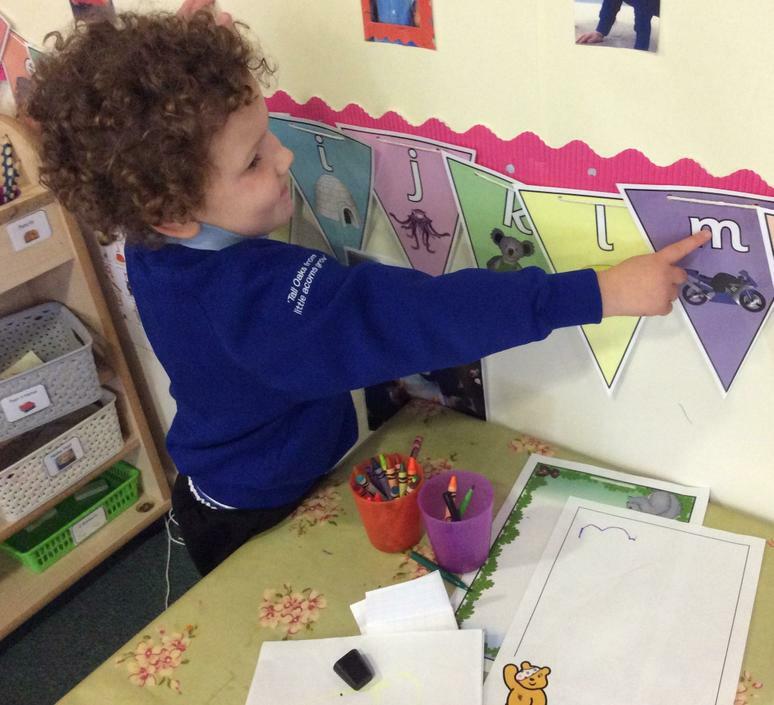 We truly believe that Nursery is such a fun place to be and learn! 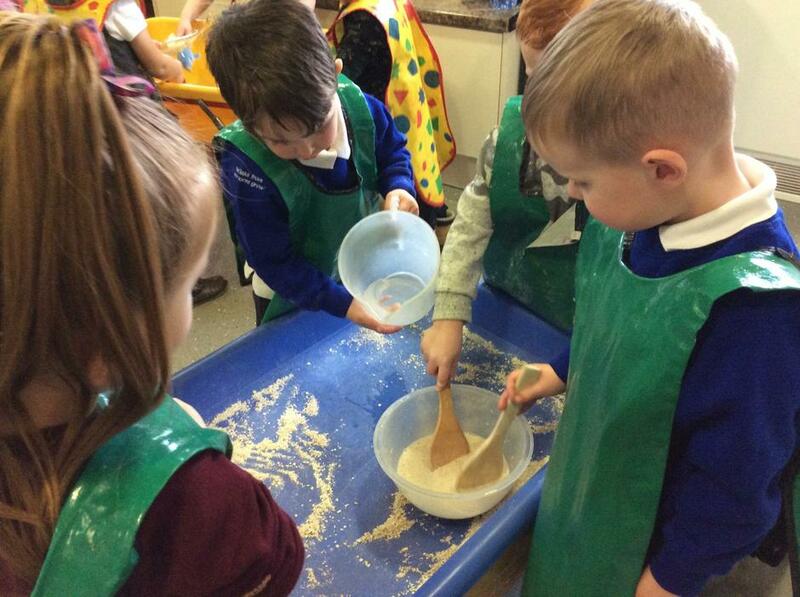 The children have been extremely busy already and we are lucky to have some new children join our Nursery. Our topic this term is Marvellous Me! In this project, the children will learn all about love, families, friends, and how people are the same and different. During the school day we have lots of fun and learn in a variety of ways! Monday’s, Wednesday’s and Friday’s: Dough Disco! Once a week the children will also visit the outdoor classroom where we sing songs and play games. Please see our Nursery Timetable next to the door in our classroom for further details of our school day. We like to learn in a variety of ways. In our classroom you will be able to find an array of different areas for the children to have fun and play. We also have a class bear. His name is Ted. 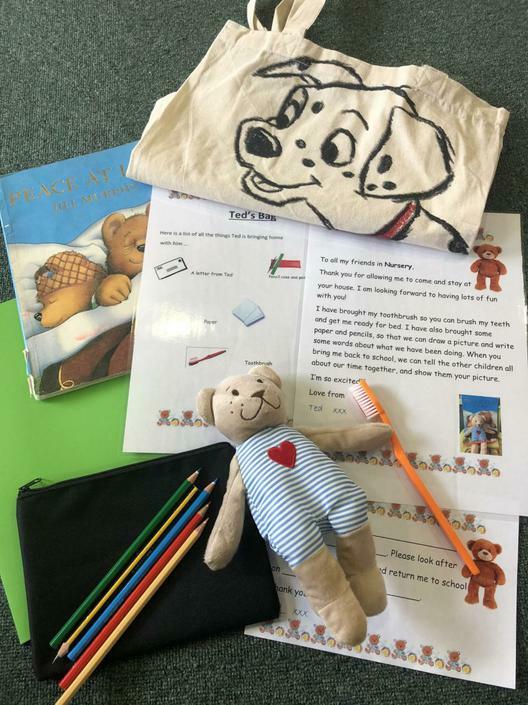 Ted is an educational bear who loves bed-time stories, brushing his teeth, playing games, writing, and drawing pictures. If your child is chosen to take Ted home for the weekend, please take some time to sit with your child and enjoy these activities. Ted will visit on a Friday, and should be returned to school with all his belongings on Monday.